MissouriRecord.com Cartoon: "Wagner to Enterprise. We've encountered hostile life forms. Beam down more money." Enterprise says "no company resources have been used or will be used on behalf" of Wagner's campaign. ...Ray Wagner is not a registered lobbyist. However, Ray Wagner is Government & Public Affairs Vice-President for Enterprise. In that capacity, he stewards Enterprise's lobbying activities, so focusing on the fact that he personally is not a lobbyist obscures the point that all of Enterprise's lobbyist are his subordinates. I think people read that Ray isn't a lobbyist, breath a sigh of relief, and then miss the fact that he hires, fires, promotes, compensates, and directs the daily activities of Enterprise's fleet of lobbyists. As the head of government affairs he directs their lobbying efforts including which candidates and issues Enterprise supports. He provides the strategic vision for their corporate lobbying efforts while others typically implement that vision on the ground. My question is whether or not Ann Wagner or Enterprise have violated FEC regulations. As Wagman wrote in the Post Dispatch: "Even using company stationery on a fundraising plea could be a potential violation." In Federal elections most donations to a new candidate for public office come from individuals. And donations from individuals to a Federal campaign are limited to $2,500. In Missouri state races, there are no limits and you tend to see a greater percentage of PAC money go to candidates. As the Government & Public Affairs Vice President, Ray Wagner would oversee those donations from Enterprise's PAC to Missouri state house races. Candidates for office use a lot of different tactics to drive fundraising. In the St. Louis area, trivia night competitions are one popular fundraiser. A trivia night will involve a number of topic categories (history, sports, entertainment, etc.) from which questions will be asked. The individual or table that gets the most correct answers will win a nominal, often donated, prize while the money raised will go to the candidate's campaign. While you can buy a seat at a trivia night, it is much more common to get a group of friends together and buy a table. Corporate PACs often buy tables at these fundraisers. 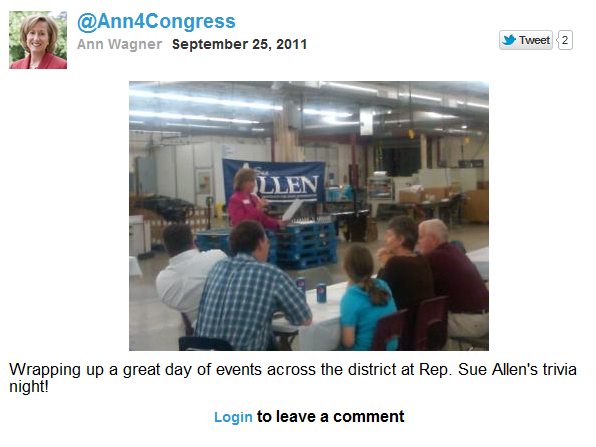 Late last September, Missouri State Representative Sue Allen held a trivia night fundraiser. Sue's a solid conservative who's district has significantly changed in Missouri's recent redistricting. She needs to raise funds to increase her name recognition because of those new boundries--find out more about Sue Allen and donate to her campaign. To encourage donors to purchase tables at her September trivia night, any donor who bought a table would be allowed to read the trivia questions for one round. On September 14th, Enterprise Holdings Inc. PAC donated $1,000 to Missouri State Rep Sue Allen. That's documented on page ten of Sue Allen's October Missouri Ethics Commission disclosure report embedded below. No one with the name "Wagner" is mentioned in that disclosure report. As you can see in the picture below, Ann Wagner's reading questions at Sue Allen's trivia night. Reports from attendees at that fundraiser indicate that she read questions for four rounds. Is this the strategic vision of Ray Wagner: to buy a speaking platform in front of a room full of donors for his wife, a candidate for Congress, and finance that platform with Enterprise PAC money? I don't know if that rises to the level of using Enterprise stationary for Ann Wagner campaign solicitations, but it is an advantage other candidates around the country do not enjoy.